We all know by now … or we should know by now … that the admixture percentages reported by the genealogy DNA testing companies are really rather awful at the level where we really want the information: the country level. But what about at a broader level? At the continental level? Can DNA testing give us accurate information about our ancestral origins as between, say, European and African and Asian? Yes, European and African and Asian DNA shows very distinct patterns. At the continental level, autosomal DNA can tell us a lot about our deep ancestry. But here’s the rub when we try to use it. Each of us inherits 50% of our autosomal DNA from the father and 50% from the mother. So the odds of showing our ancestral origins if either parent was 100% European or 100% Asian or 100% African are essentially 100%: the child’s autosomal DNA should show roughly 50% of each parent’s ancestral origins. But let’s say each parent was a 50-50 mix: one parent was 50% European and 50% African, and the other was 50% European and 50% Asian. On average, each child of this couple would end up showing roughly 50% European, 25% African and 25% Asian. Still a high percentage, still clearly detectable. If Shirl’s ancestor was already passing for white in the late 1700s, we’re probably talking about a racial mix in the sixth or seventh great grandparent generation: the first generation where African and European ancestry came together. In other words, if the family story is true, Shirl’s African ancestry is likely to represent not more than about 0.2% of her autosomal DNA. Again, some people will have a higher percentage from an ancestor that far back, and some will have a lower percentage, in both cases by pure random chance. It’s a matter of whether or not Shirl won the genetic lottery and actually had that African DNA passed on to her. Now if Shirl did win the genetic lottery, she could have that 0.2%. So… is 0.2% detectable? It can be. At 23andMe, for example, my own results show 0.2% sub-Saharan African at both the standard and the speculative levels of confidence. Once I go to the conservative confidence level (a level where the scientists think they’re 90% sure4), however, my African ancestry fades into the background. And not every company reads our DNA the same way. 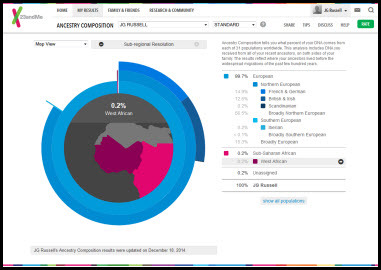 At AncestryDNA, my results still indicate less than one percent African, but there it’s shown as Africa North, rather than sub-Saharan Africa. And at Family Tree DNA, my results don’t show African at all; they show some from Asia Minor instead. That’s our first problem: if we do find detectable African DNA, it won’t tell us, by itself, how far back in time the DNA comes from. It can give us some hints, pointing us to a general time frame where we can start looking at the paper trail, but by itself it can’t prove when our African ancestor lived. So it’s worth doing autosomal testing to look for this small an amount of possible African ancestry. What’s critical is understanding that finding it won’t tell us how far back in time it came from, and not finding it doesn’t prove we don’t have African ancestry. I think that all of the genealogy-related DNA testing companies have to develop their own proprietary models, which compounds the issue of interpreting results. True? Then the DNA data in question when applied to company A’s model may be identified as originating in one region of the world, and when matched to company B’s model it’s a nearby region. I’m not surprised – and in fact welcome it – when companies rerun their models to reflect the richer datasets they are accumulating. My %’s change somewhat, and I believe that the results are getting just a little bit better each time. Yes, each company has its own dataset that affects its analysis. I wish I could agree that the results are getting better; my problem is that as long as the datasets compare living people to living people, I fear there will always be an inherent error factor that renders the results less than useful. My friend Blaine Bettinger suggests that real improvements may result when we factor in ancient DNA, from the oldest bone samples we find and analyze. So, it doesn’t disprove it. But does is prove it? In one set of three oldest generation siblings, two showed zero African, but one showed 1% or <1%. Does that prove there was African ancestry? Or could it just be noise? (Same scenario for another group of three where one showed 1% European Jewish.) Thanks. The Gates-Bryc article referenced in footnote 5 probably gives you your best answer. Thank you for the prompt and thorough reply. I am, by profession, a molecular evolutionary biologist, so I well understand the generational DNA dilution effects, hence my question as to whether the current state of autosomal testing would address my hypothesis. As it turns out, my family has rather long generation times and the ancestor in question was my 4th great grandmother (b.1779), bringing the ideal percentage to ~1.56. But I suspect that recombination, in my case, has not favored retention of that line. Since DNA recombination is not random, i.e. some parts of chromosomes recombine frequently, others not at all, certain traits remain linked through generations. While I have no obvious phenotypic traits of my maternal ancestry, my older brother has many and may be a more suitable candidate for testing. Does this seem reasonable? You’re very fortunate in having those long-tailed generations, so the higher percentage sure gives you a better chance to detect the ancestry. As for who to test, you undoubtedly know, since you have training in biology, that phenotype and genotype can often mismatch, so I would test both yourself and your brother. While his phenotype may be more suggestive, your genotype may show evidence as well. When it comes to autosomal testing, it’s so inexpensive these days ($less than $100 a person) that the standard recommendation is to test everyone you can afford to test. The 1.56% can be a bit misleading. You should inherit around that amount from a 4th gr grandparent BUT your gr grandmother in question was already admixed enough to have been able to PASS for white so the amount of African Dna she possessed was likely under 25% of her total dna. So the MOST of that amount she would have passed to you would be around .39%. I agree that the total amount is likely to be lower than 1.56%, but again caution that every one of these cases involves a range — these percentages are not cast in stone but range enormously. Thanks. The breakdowns of average percentages inherited on a generation-by generation basis was very clear and helpful.